The mobile friendly MyDeepBlue Dashboard provides unique insight into your guest WiFi network. 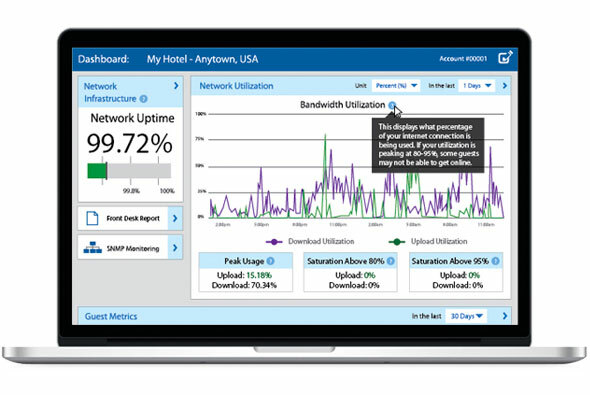 Whether you’re managing one property or many, this dashboard delivers easy to understand data about your hotel WiFi infrastructure and utilization, SNMP monitoring and guest metrics. The dark ages of wondering what is really going on with your WiFi network are finally over! Monitor your upload and download speeds to accurately gauge guest experience. Know if your devices are working properly, never doubt the status of your devices. Review all your guest surveys to catch issues and resolve them before they become problems. Track revenue per tier in 30, 60 and 90 day intervals. Wondering if you have enough available bandwidth? Verify it here. Managing multiple properties? Consolidated reporting with comparative and trending analysis. Need more details about your network performance?